When the Nexus 5 first came out, one of the most talked about changes was the Google Now integration into the new Google Launcher. Sadly for many hopeful adopters, Google had said it was only be available for the Nexus line of devices for that point in time. However, that was then and this is now. Google Search has now updated to include Google Search Launcher. 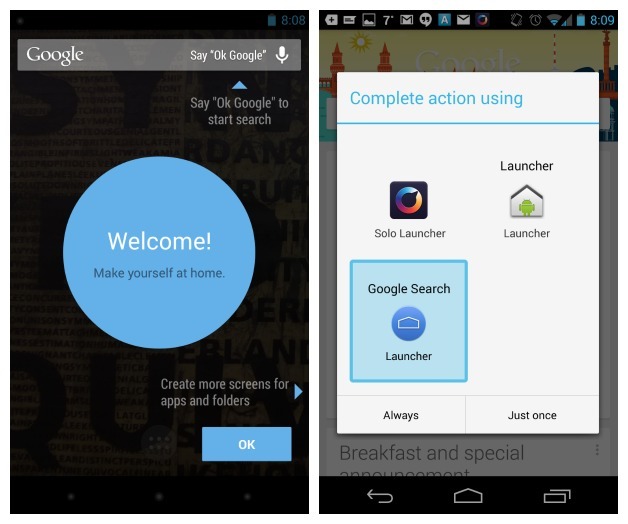 This will give you the stock Google launcher no matter what phone you're currently using. However, it's unclear if all phones will have the "Ok Google" hot word to activate the the voice commands, allowing users to get an extra step closer to stock Google from any phone is something many will accept with open arms. As many of us know by now, Google app updates don't always roll out to everyone at the same time. So if you haven't get it yet, just have a little patients, it is on its way.